Navratri, Navaratri, or Navarathri (Sanskrit: नवरात्रम्; Marathi: नवरात्र; Gujarati: નવરાત્રી; Hindi: नवरात्रि; Nepali: नवरात्रि; Bengali: নবরাত্রি; Kannada: ನವರಾತ್ರಿ; Telugu: దుర్గా నవరాత్రులు; Tamil: நவராத்திரி; Malayalam: നവരാത്രി) is a Hindu festival of worship of Shakti and dance & festivities. The word Navaratri literally means nine nights in Sanskrit, nava meaning nine and ratri meaning nights. 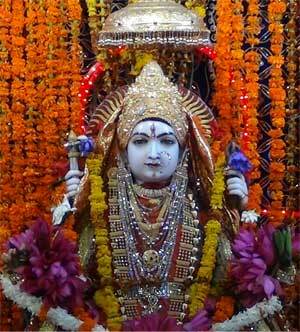 During these nine nights and ten days, nine forms of Shakti/Devi are worshiped. The 10th day is commonly referred to as Vijayadashami or Dussehra. ‘Nav’ means ‘nine’ and ‘ratri’ means ‘night’. Thus, ‘Navratri’ means ‘nine nights’. There are many legends attached to the conception of Navratri like all Indian festivals.All of them are related to Goddess Shakti (Hindu Mother Goddess) and her various forms. It is one of the most celebrated festivals of Hindu calendar, it holds special significance for Gujratis and Bengalis and one can see it in the zeal and fervor of the people with which they indulge in the festive activities of the season. Dandiya and Garba Rass are the highlights of the festival in Gujarat, while farmer sow seeds and thank the Goddess for her blessings and pray for better yield. In older times, Navratri was associated with the fertility of Mother Earth who feed us as her children. The first three days of Navratri are dedicated to Goddess Durga (Warrior Goddess) dressed in red and mounted on a lion. Her various incarnations – Kumari, Parvati and Kali – are worshipped during these days. They represent the three different classes of womanhood that include the child, the young girl and the mature woman. Next three days are dedicated to Goddess Lakshmi (Goddess of Wealth and Prosperity), dressed in gold and mounted on an owl and finally, last three are dedicated to Goddess Saraswati (Goddess Of Knowledge), dressed in milky white and mounted on a pure white swan. Sweetmeats are prepared for the celebrations. Children and adults dress up in new bright-colored dresses for the night performances. In some communities, people undergo rigorous fasts during this season that lasts for the nine days of Navratri. The festival culminates on Mahanavami. On this day, Kanya Puja is performed. Nine young girls representing the nine forms of Goddess Durga are worshiped. Their feet are washed as a mark of respect for the Goddess and then they are offered new clothes as gifts by the worshiper. This ritual is performed in most parts of the country. With commercialization, the festival has moved on to be a social festival rather than merely a religious one. However, nothing dampens the spirit of the devout followers of Goddess Durga, as they sing devotional songs and indulge in the celebrations of Navratri, year by year..